Since 1968, Hot Wheels have been a staple of every car-loving kid's toy box. Aside from their meticulous attention to detail, the speeds they reached going down those wobbly plastic ramps easily topped a scaled 300 mph. The main reason for this? The bearings were designed by an eccentric engineer who designed missiles. That's just one of the 16 things you (probably) didn't know about Hot Wheels. Here are the rest. 1. Several of Hot Wheels' most noteworthy creators are legit car designers. Larry Wood oversaw the design of most of the cars you grew up playing...but before his career at Mattel, he spent much of the 1960s working for Ford. 2. Larry once put his real home phone number on the side of a tow truck. This lead to many, many phone calls from children and parents alike. And yes, he ultimately changed his number as a result. 3. Hot Wheels’ research and development head was a complete badass. Before HW, Jack Ryan (100% real name) worked at Raytheon, where he was instrumental in the development of both the Hawk and Sparrow missiles. He was later hired by Mattel for his knowledge of high-tech materials and is credited with making inanely good bearings for Hot Wheels cars. Also Barbie. He made that too. Later, for good measure, he married Zsa Zsa Gabor. 4. According to Mattel, Hot Wheels got its name from an offhand compliment. 5. What isn't disputed is that his El Camino was a major inspiration to the entire lineup. It was indicative of California custom styling at the time, and Elliot told Harry to use it as a guideline. This is one of those first cars. It's um...vaguely similar. 6. Hot Wheels released its 1968 “Custom Corvette” before General Motors released the real deal. The generally accepted tale is that since Harry Bradley had worked at GM just prior to his stint with Hot Wheels, he managed to acquire the plans to the car, thus enabling an early release. These days manufacturers are upset if so much as a grainy photo leaks a couple hours early. *Note to current Hot Wheels designers: Please make a series with pre-production prototypes in various stages of camouflage. 7. The first few years of Hot Wheels models all had a red stripe on the tires. Prices on these are significantly higher than most other cars, and it's not uncommon to see prices exceeding $100 each. Some people even restore them, though a Hot Wheels category at Pebble Beach is probably still a ways away. 8. Every single one of the 16 original Hot Wheels is based on an actual customized vehicle. Not just normal vehicles either. 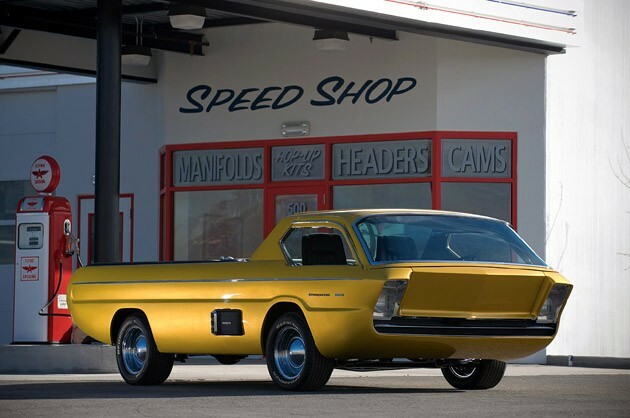 The Dodge Deora was designed by two brothers in 1964, and it won so many awards that Chrysler actually bought it and kept it amongst other concept vehicles for years, before selling it to a major collector. 9. Today, there are more Hot Wheels models than real cars in the world. Over 4,000,000,000 (yep, four billion) have been produced since the first was cast in 1968. 10. Hot Wheels actually made a car coated in diamonds. It was designed by a celebrity Beverly Hills jeweler to celebrate the brand’s 40th anniversary. Over 3,000 diamonds combined for just under 23 carats. 11. Since 2001, Hot Wheels has been building real cars. It started with this, the Twin Mill, which features two engines and over 1,400 hp. The company continues today with cars like 2014’s Darth Vader car, which was built on a Corvette platform. 12. Some of the collectors are lifelong devotees. There are multiple guys with collections topping 30,000 cars, and one of their collections has an estimated value of over $1,000,000. 13. This passion occasionally leads to intra-club rivalries. The Blue Real Riders Club is an entire website dedicated to complaining about the Red Line Club, which is the official Hot Wheels club. The entire gripe is over wheel selection on new models that people vote for. Crazy. 14. There’s a cottage industry of Hot Wheels customizers. We’re not just talking about that time you tried to paint your Hot Wheels using water colors and completely ruined it, we’re talking dremels, welders, and air brushes. 15. One of its designers revamped a car his dad originally designed for Hot Wheels 30 years earlier. Alec Tam managed to get a scholarship from SEMA, and after establishing himself as a designer, joined the Hot Wheels team where he paid tribute to his dad’s original Whip Creamer. Pretty nice tribute, that. 16. The price of a basic Hot Wheels model hasn't changed. You could pick one up for 98 cents back in '68, and you can get one for a buck today. Compare that to a cheeseburger. Aaron Miller is the Rides editor for Supercompressor, and can be found on Twitter. He just looked at some prices for some of his old Hot Wheels. He'd never have let himself even open them if he knew what they'd do in price.